Belonging to the Sixteen92 Circle has been very enjoyable. Normally I am not one to sample scents often. I like to buy full bottles based on scent notes and in general that has been pretty successful for me. The drawback to that is that I don't take many risks and I tend to avoid particular notes or genres. Being a part of The Circle means that I get to sniff and wear every perfume in a debuted collection and often I am pleasantly surprised. A perk to being in The Circle is also the Circle exclusive scent which was generously gifted during the Poe winter collection. I love that I just finished reading many short stories and poems by Edgar this past year. It makes these perfumes even more special. 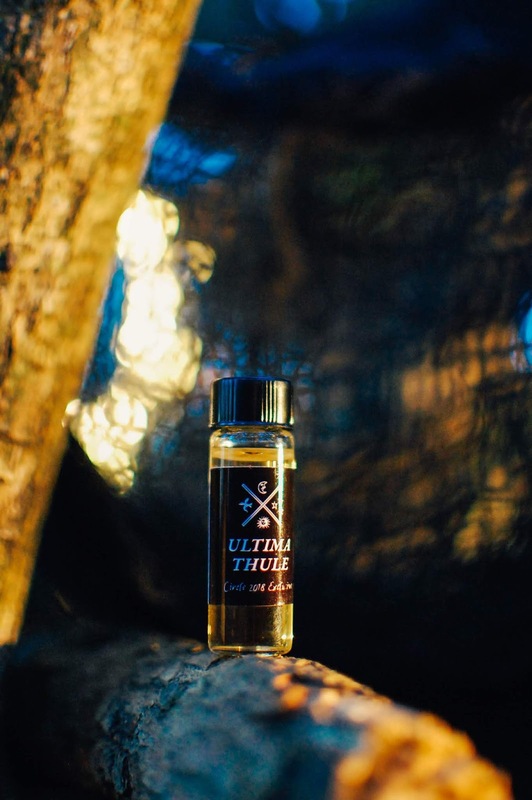 Ultima Thule- Notes: Burning black woods, warm resins, cashmere musk, chestnut, clove bud, black pepper, toasted vanilla. In the bottle vanilla floods the senses in a current of lush creaminess with pepper and smoked spice sliding underneath the rippling vanilla as dark shadows. The hefty vanilla base acts as the foundation for piling smoking resins and incense and spice on top. On the skin this ignites like marshmallow on the tip of a nobby stick held to the flame. Briefly I think I am wearing Arcana's Holy Terror mixed with Krampus Cones on the wrist. But as it wallows into the wrist that suggestion shifts ever so slightly as the cashmere musk and buttery chestnuts waft in to give a gourmand warmth and sweetness. I adore the clove bud in this. It is russet and sugared. As the heart gives away to the base, incense pours back in and smudges the scent into churchy resins and smoke. It is a lovely scent that will get worn until it runs dry. 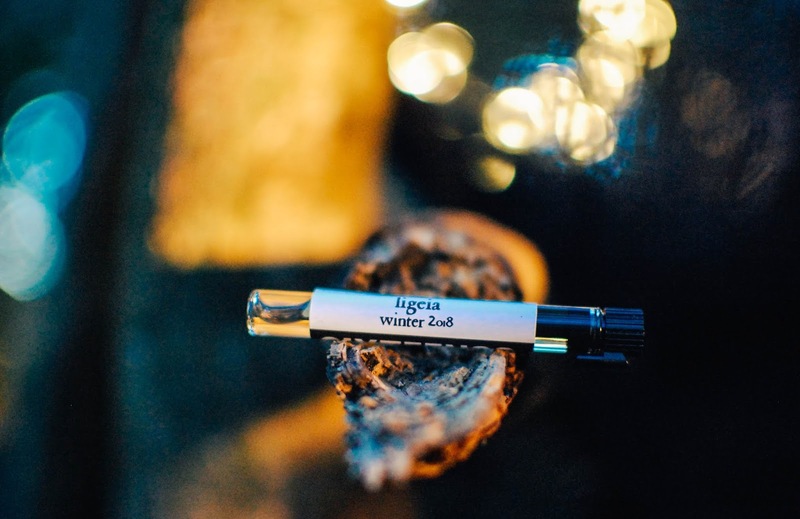 Ligeia- Notes: Ash, gardenia, opium haze, aldehydes, white iris, honeycomb, ambergris and cold skin. Drenched on the skin the honey drips in viscous strands from familiar pale lips, infused with the last breath of cool papery iris petals. This is ephemeral like the wraith of a long-lost love come to life under the gossamer veil of the moon for a brief moment. Chalky ash gathers in drifts in a mausoleum bereft of warmth, shrouded in stone. As it lays itself to rest the perfume takes on a warmer skin musk that is feathered with light leathery tones. It might be the ambergris which always smells strangely human and warm to me. Perhaps because it comes from a fellow mammal. I love the transformation this one takes from cold and aloof to a tactile embrace of amber musk. It is a beauty. 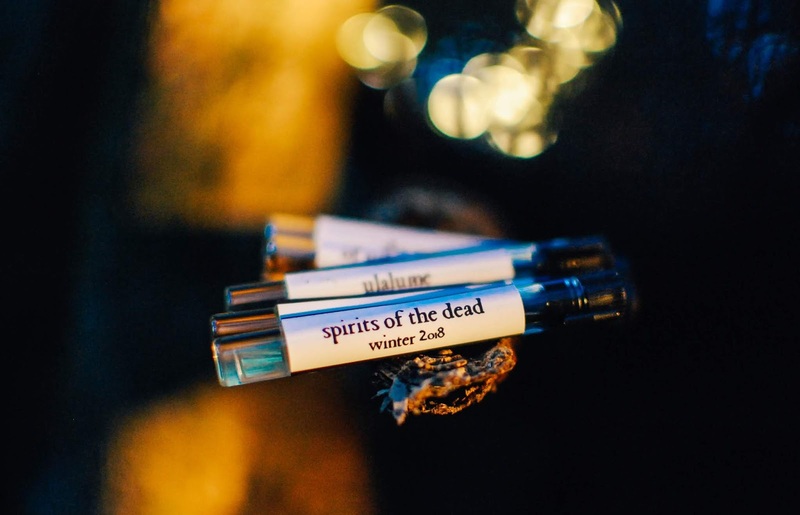 Spirits of the Dead- Notes: Lapsang souchong, guaiac wood, saffron, black birch, Italian bergamot, styrax, vanilla pod. This one starts off illicit and foreboding immediately. The pines-on-fire image that lapsang souchong rustles in my mind merges with leathery styrax and darkens into a sooty shadow. If seances could be bottled it would take on this aroma. Tragic and ashen, coal black and mystical. This smells like shadows. Resurrection stones. The veil ripping. As it drifts further into its journey the vanilla and bergamot somehow entwine to create a suggestion of sweet tobacco, sun warm and rich. The seance ends on a calm vanilla waft. I adore this leathery smoky wooden experience. Full bottle worthy. 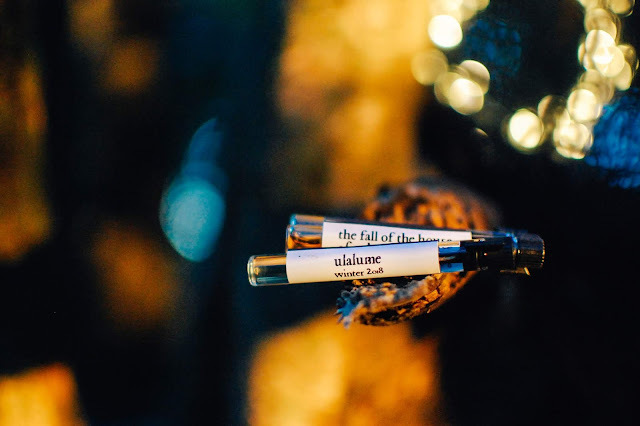 Ulalume- Notes: Moonflower, toasted almond, tonka bean, sweet fennel, narcissus and mourning veils. A lush aroma of heady flowers with peppery hearts help mask a sweet cyanide of honey coated almonds, some sugar and poison. Where Mercy Lewis is more wooden with powdery musk as if experienced through gauze, Ulalume blooms with tension and clarity, viewed under an electric moon. The open faces of the moonflower and narcissus outlast the sugared almond sweetness and weave into a freshly tatted linen and lace shroud. Cottony. Billowy. Serene. 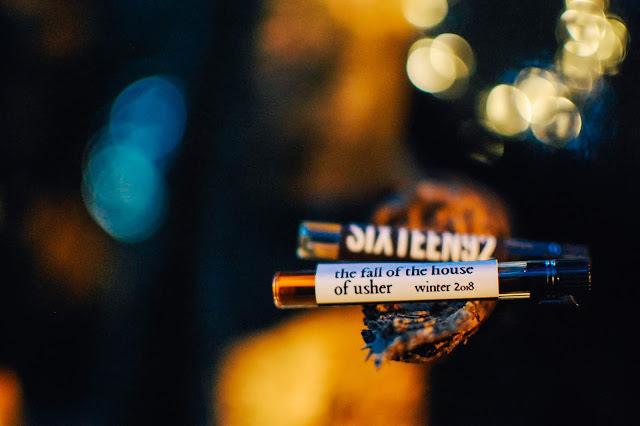 The Fall of the House of Usher- Notes: Pine and fir needle, frozen hemlock, amyris, sweet myrrh, shadowed stone, precious woods. Claire does work magic with her ability to craft notes that truly do invoke cool and chilly sensations without making the skin tingle. On the wrist ice encased evergreen needles cluster in bunches within a desolate landscape. Their frozen shards fall away as the dilapidated manor comes into view. Funeral flowers, lilies and bulbs, struggle to emerge from tangles of brambles and clods of soil that bracket the house. A trembling hand reaches for the rusted door handle and cracks it open. Surprisingly the soft and beautiful aroma of incense and dusty musk creeps from the cracked open entry. This home is melancholy but still inhabited. For now. 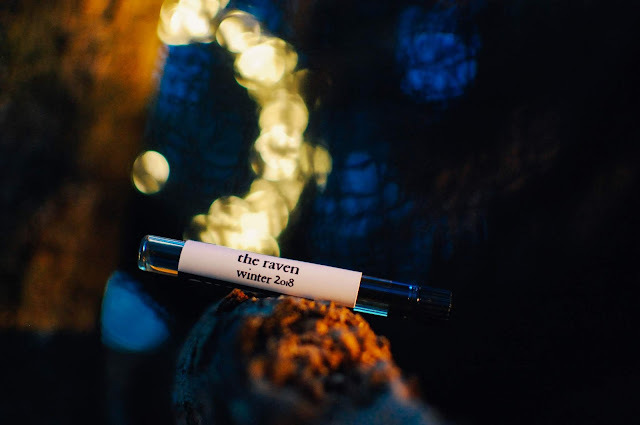 The Raven- Notes: Tea leaf, plum wine, silver mirror, library dust, dried tobacco and black feather. The Raven starts dulcet and sweet with fruity tobacco but then quickly develops a steely spine. The tea prickles and the mirror shatters within the heart of this scent. This is the raven as he turns from innocuous to malevolent. This is the beak in the bosom. The sharpness eases as the scent settles into the skin and the tobacco dries into brittleness. The raven flies from the bust, disturbing the dust bunnies and sending motes into the air. Dried tobacco, desiccated wood and a drop of ink. I love the Poe Collection. It is brilliantly fleshed out and the scents evoke their muses wonderfully. Spirits of the Dead needs to come home with me. 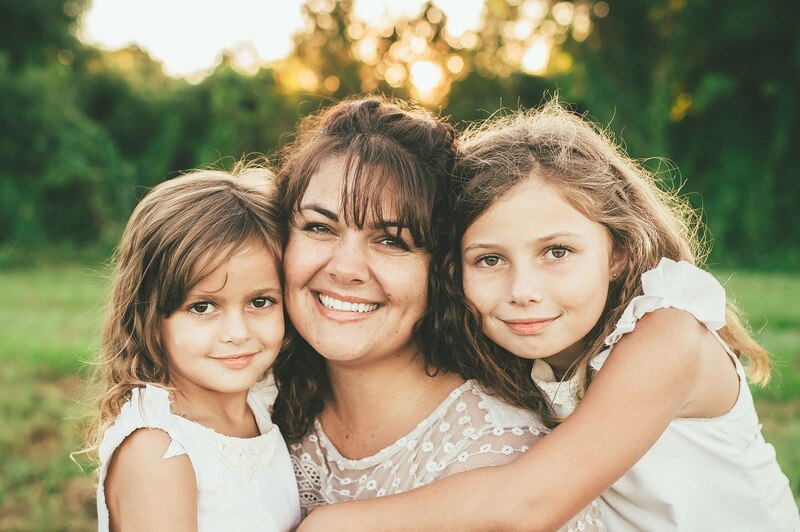 Do any of these resonate with you? It really is! Claire really fleshed this collection out with a fine hand and an eye to detail. Sixteen92 can be interesting. I find some have a base that tends towards a stoney musk that can be slightly cool and papery on my skin. Sometimes I like it but I need to be in the mood for it. Other times the scent will just click with me. Her soil scents really work on me. And Black Sugar. I love that one. But you are right. Not every house works on all skins. I have some perfume oils that just tend to not work for me either from certain houses. But that is actually a good thing as I have plenty of houses to follow as it is! LOL! Hoping your perfumes work out for you. Let me know how they aged. So far, I just tried one and it still has this rubbing alcohol, medicinal smell to me that I don't care for. I gotta try more though when I feel up to it.